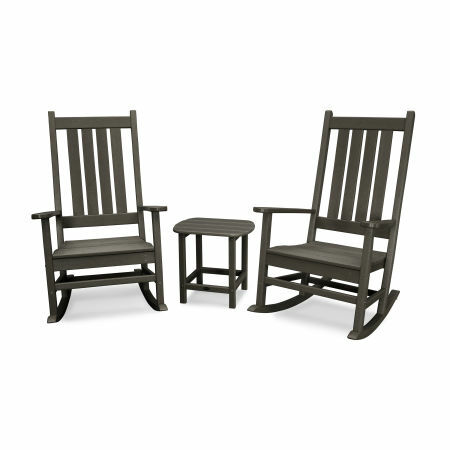 Rely on the timeless comfort and impressive durability of a POLYWOOD® rocking chair set complete with side tables, ottomans, conversation tables, and fire pit tables that bring any outdoor event to life. 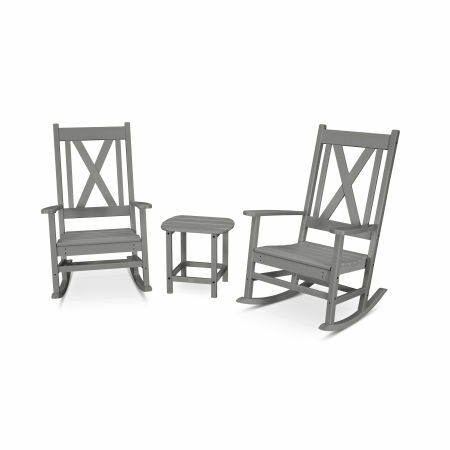 Makeover your empty porch or patio with one purchase — a POLYWOOD® rocking chair set. 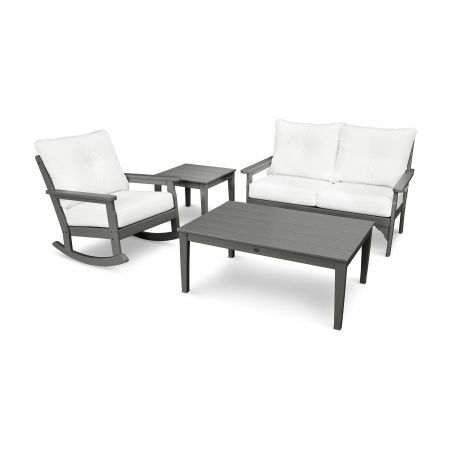 Deep seating, woven, or Adirondack rockers combined with stylish side tables, ottomans, and fire pit tables to create the ultimate conversation setting or relaxing escape. 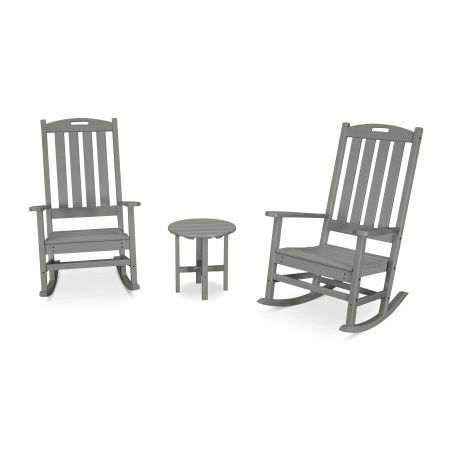 Remove the logistics from coordinating several different pieces of furniture yourself by ordering one of our curated rocking chair sets for your porch retreat or poolside chat corner. 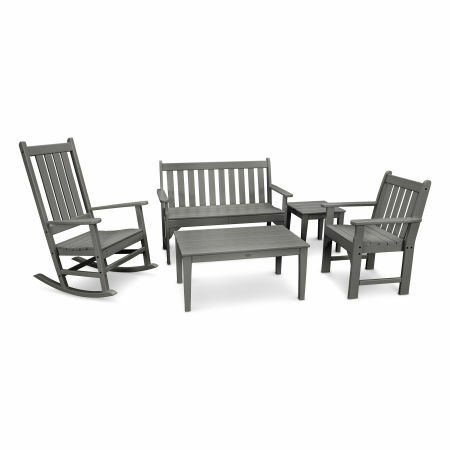 Ensure there is ample seating for friends and family with matching rockers, deep seating pieces, benches, and gliders all crafted for durability and longevity. Create a space where you can relax with the comforting motion of rocking chairs created to complement modern and classic design elements. Choose between several unique styles and combinations of rocking chairs to find the ideal set to suit your needs and fill your space. 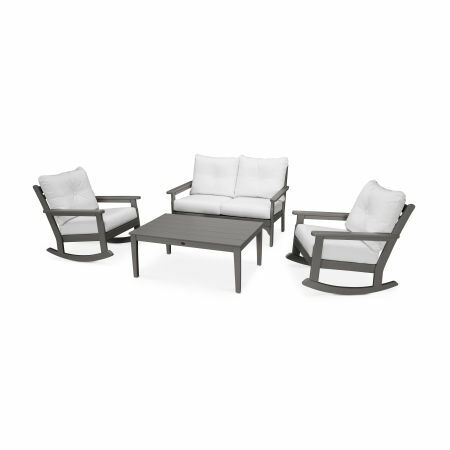 Surround a fire pit table with four Vineyard Deep Seating Rocking Chairs for endless evening conversation, or place Jefferson Woven Rockers and a side table by your front door for a traditional front porch setup. 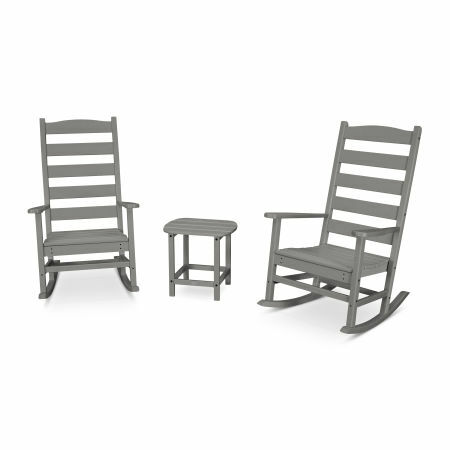 POLYWOOD® rocking chair sets are available in a wide variety of earth and neutral tones as well as vivid colors so you can choose the best color for your outdoor space. Select sets that include functional furniture like fire pit tables, ottomans, and side tables to transform the possibilities of your deck or porch. 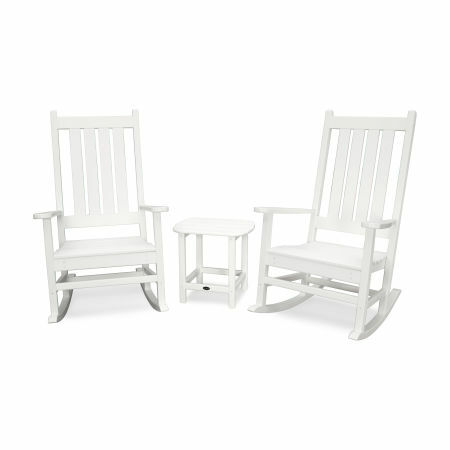 Your rocking chairs can remain in direct sunlight due to our signature Color-Stay Technology. 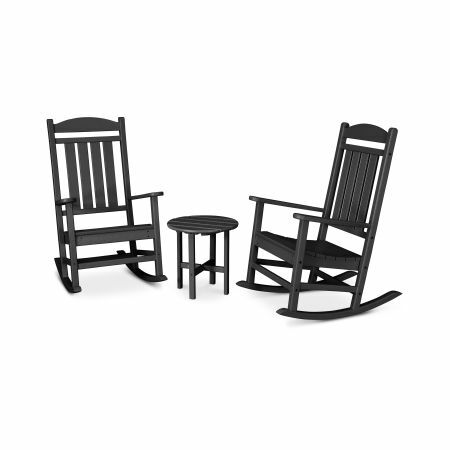 Every rocking chair, ottoman, conversation table, and fire pit table included is built with weather resistant HDPE lumber that’s extraordinarily durable — your rocking chair sets won’t crack, rot, chip, or degrade. 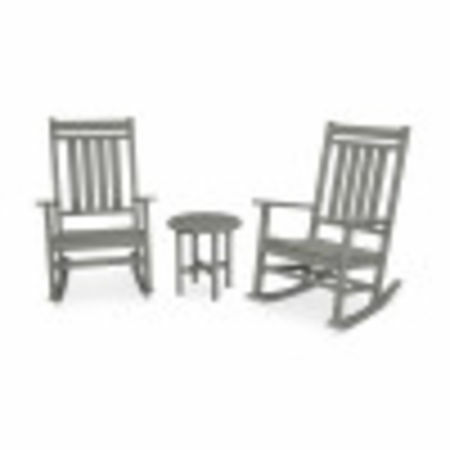 Elegant yet sturdy rocking chair sets are impervious to winds, extreme temperatures, rain, and snow. In order to properly maintain your outdoor furniture simply wipe it with a damp cloth and gentle soap as dust or dirt accumulates. 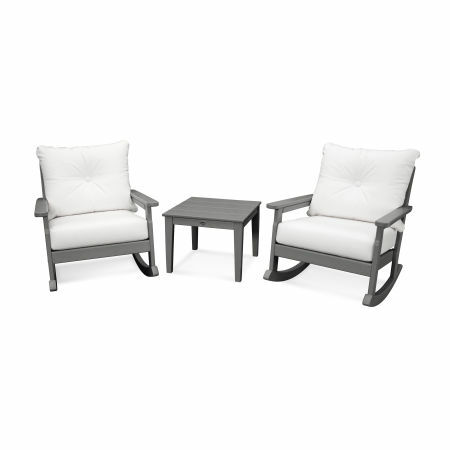 Take advantage of a cozy spot of dependable shade and fill it with a deep seating rocker set. Spend hours regaling family with stories of years past as you marvel at your gardening handiwork. 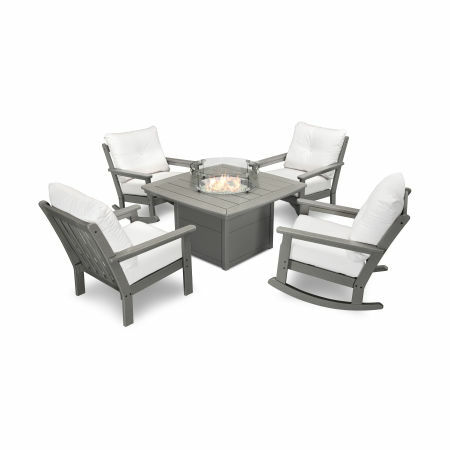 Many rocking chair sets come with a low-maintenance fire pit table that brings the power of an adjustable flame to the comfort of your backyard. Make s’mores and swap ghost stories as the roaring flames warm you up on a cool autumn night. A single rocking chair provides a quiet escape for a morning cup of coffee, but when your family grows, outfit your porch with a rocking chair set — the perfect spot to snuggle up and rock with your little ones in your lap. Choosing an entire set may seem like a big commitment, but as long as you’re confident in your rocking chair purchase everything else boils down to functionality. Make your decision without a second-guess by reading our Rocking Chair Buying Guide on the POLYWOOD blog.